This project originally started out as the desire to have a bike as close as a mere mortal could get to Marty Smith’s factory RC500 racer. I saw one similar to this for sale on a web site and thought it was pretty cool, but I thought it could be done better so I decided to give it a try. I believe there to be only a hand full of these in existence and after a hundred or so hours of fabricating I now understand why. 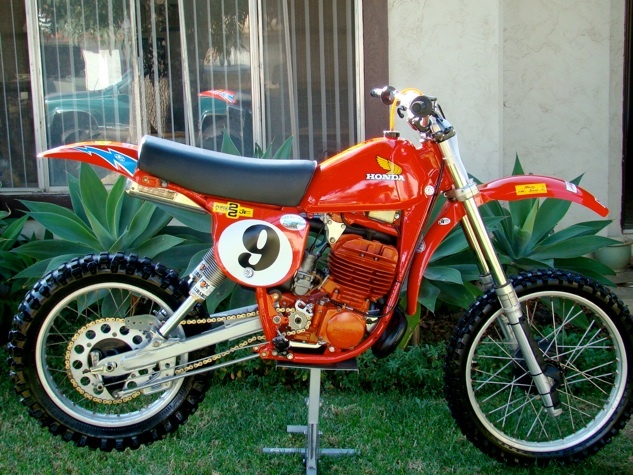 My RC project began life as a 1980 Honda CR250R Elsinore bucket of parts that I found in Carlsbad Calif. I sold off the engine and related parts and kept only the frame, seat, swingarm, Fox Shox, and airbox. Next was a ‘79 Aluminum gas tank from a CR250R on e-bay, as well as a set of late model cartridge forks and clamps. The last major find was a 1982 CR480R from El Cajon, California which I only needed the motor, frame mounts, & wheels. The bulk of the labor was centered on the motor mount fabrication. I wanted it to look as factory as possible so that meant no bracket adaptors. Only the rear mount was left untouched, all other were fabricated from 6061 T-6 aluminum. The gas tank required new mounts to be welded in, as well as the ‘79 side panel mounting tabs. God bless Miller Mig’s. All of the brackets, mounts, and tabs were taken from the donor CR480R frame. If you look carefully you’ll see the Husqvarna rear brake stay that was custom mounted and lower chain roller. I chose this for its simplicity and most of the factory Honda’s from the late 70’s were copying the husky set-up. The motor was torn down and re-ringed and an ‘83 CR480R clutch (stronger) was swapped in. The entire bike was raced a couple of times at my local vintage club for proof the concept and to verify the welds, before being torn down for the powder coaters. I plan to campaign this bike during the upcoming 2009 season in my local Post Vintage 500 class. The bike is a real pleasure to ride but a little tough to keep the front end down.